So I was at a Bastille Day Party the other night, wearing a necklace made from slices of baguette, pine cones, and sea shells. It was sort of primitive, sort of campy, sort of Cote de Azur meets Rehoboth. I’d seriously thought about adding some cornichons and olives to the piece, but decided the oil might stain. Costumes weren’t actually required, but the hosts always make an effort to wear something festive at their fetes — they were outfitted in berets and moustaches. Nibbling an aromatic cheese, I began chatting with a couple of Querelle wannabes about big theme parties and about how they seem to have all but disappeared in Rehoboth. When I first began visiting Rehoboth in the late 80’s, theme parties were de riguor. The social scene revolved around group house parties. Every Saturday night you could count on one or two. There were squirt gun parties, jungle parties, salsa and sauna parties, wild west parties, and just plain birthday parties. The whole scene reminded me of a big gay frat party. Lots of liquor. Lots of testosterone. Lots of fun. They were competitive, these parties. Groups vied to outdo each other by grabbing certain dates and times, by creating special cocktails, and by putting hunky shirtless guys behind the bar. CAMP’s Steve Elkins recounted for me some of the theme parties he and Murray Archibald helped put on when they were young pups and part of a group rental house over on Christian Street. Their first one in 1983 was a “Madras Party” where the driveway and backyard of the house was surrounded by a maze of 5-6 foot wide canvas — painted by Murray, of course, in a perfect Ralph Lauren style madras pattern. Then came the “Aquamarine and Tangerine” party where they not only painted canvas for the outside in those colors, but also repainted several rooms in the house to fit the theme. Year three brought a “White” party. 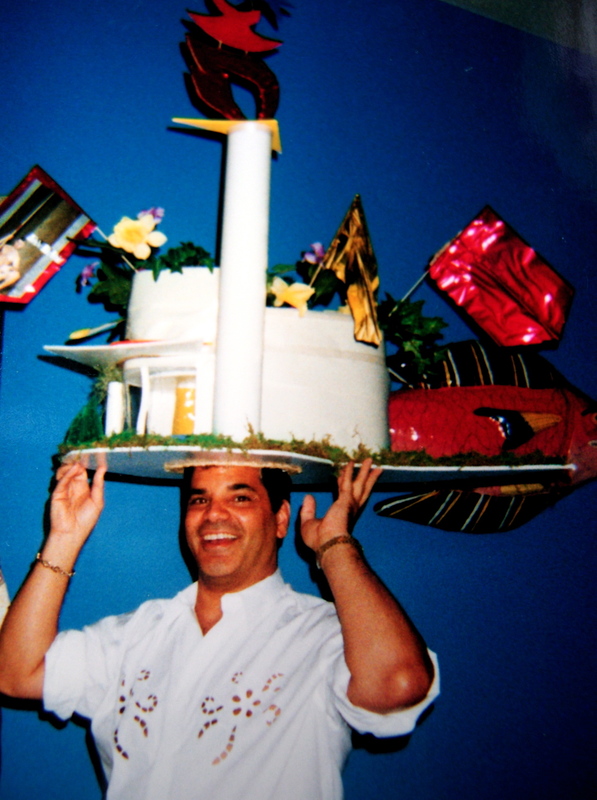 Another memorable and long running theme party was the Hat Party, which started as a small private fete and evolved over the years into one of the first local AIDS fundraisers attracting upwards of 700 people in its halcyon days at the Strand night club. Old timers remember one particular hat party on Sussex Street in the late 80’s. An especially large crowd turned out and there were gays out in the street in drag and outrageous hats. The hosts even hired the Jolley Trolley to make a special trip from the Blue Moon to the party. At the stroke of midnight, the police raided and shut it down. It was during the height of the anti-gay “Keep Rehoboth a Family Town” movement. The next morning, a brick shattered the front window. Attached was a bible. The next year, the party moved to the Blue Moon and then to the Strand. The hats grew with the party and guys began wearing small floats on their heads. Hosts recall one hat so large that its owner had to enter the upstairs ballroom via the freight elevator. Of course, he took home the $100 grand prize with his beach scene hat complete with sand, beach chairs, and Barbie dolls. There were always a few as towering Carmen Miranda fruit hats. One guy took it a step further and wore a carved watermelon on his head, full of fruit salad. Back in the 70’s, I’ve heard tell about an annual summer earring and high heel party hosted by a long-time Republican operative from Washington in his home over by Silver Lake. Now, I’m not gonna name names. You know how those old GOP boys are. Hush hush. But, I will tell you that he served in the Eisenhower administration and organized Reagan’s inauguration. Gay theme parties have a long tradition, especially at beach towns. I’ve seen pictures of hat parties in P’town. There’s a book about Cherry Grove, Fire Island, and its history as America’s first gay and lesbian town. In it, author Esther Newton documents a Grove social scene in the 1940’s made up of small, private cocktail parties and big theatrical drag parties. Then in the 50’s the parties tended more towards afternoon high-heel parties, hat parties, Hollywood parties, and opera parties. One of my favorites she described was a late afternoon “heavenly bodies” party where towards the end out of the ocean arose a muscular Neptune with beard and trident who was carried into the party by his minions. So why have theme parties fallen out of favor in Rehoboth? Most people I ask suggest its because group houses aren’t the epicenter of gay life in Rehoboth anymore. We’ve got bars and restaurants and businesses and politics. Guys and gals that rented houses in the 80’s and 90’s have ended up buying their own houses and don’t want to subject their places to large unruly parties. Some equate the era of theme parties to freedom of expression and a young gay community flexing its creativity and its muscle. Still others suggest its because the gay population of Rehoboth is graying and prefers to sip nice cocktails made from expensive liquor rather than some concoction mixed in a garbage can. Though I must confess to acquiring at The University a taste for drinks ladled out of garbage cans into plastic cups by cute preppy fellas, I’m not advocating a return of big theme parties. I like good liquor. But, I am advocating for bringing back more conviviality and camp. It used to be that the sign of a good party was witty conversation and good looking men. Today, it’s conversation about real estate and good looking appliances. Bring back the hats and high heels I say. We need more camp in Rehoboth!